Leicester moved off the bottom of the Championship table after defeating Scunthorpe in front of prospective new manager Sven-Goran Eriksson, who watched the match from the directors' box. Eriksson is expected to sign a contract over the weekend to replace previous manager Paulo Sousa, who was sacked on Friday. And the former England boss must have been impressed as Martyn Waghorn put the Foxes in front with a left-foot strike across goal, before Lloyd Dyer doubled the home team's advantage after the break with a low finish. Leicester dominated large chunks of the game with a calibre of performance that belied their lowly position, but the complexion of the game changed after Scunthorpe pulled a goal back when a shot from Sam Togwell struck Michael O'Connor and found the net just before the hour mark. Jonathan Forte wasted a good chance to equalise, blazing wide from 12 yards, while Richie Wellens headed off the line from David Mirfin, before Foxes substitute Franck Moussa sealed the points with a low 20-yard strike deep into injury time. Chris Powell and Mike Stowell were in temporary charge of the Foxes, who had conceded 10 goals in their previous two fixtures as they slumped down the table. And they saw their side, sent out in a 4-4-2 formation, perform with purpose, desire and skill for the bulk of the match. Leicester really ought to have scored in the opening minute but Andy King could not direct his header on target after connecting with a superb right-wing cross from Paul Gallagher. Shortly afterwards Gallagher picked out Waghorn for the opening goal, with the striker showing the strength to brush aside Togwell before drilling his crisp strike beyond Joe Murphy. Gallagher shot wide with a free-kick, Dyer forced a decent stop from Murphy after accelerating past Cliff Byrne and Steve Howard missed the target with a header from a corner as the dominant home side went in search of a second. And they were almost gifted a goal before the break as Mirfin directed an attempted backpass beyond his keeper, with Howard and Scunthorpe's Eddie Nolan competing for the loose ball as it slid inches wide. Shortly after the restart, the visiting side handed Leicester another good opening when Nolan failed to find his goalkeeper with another awful backpass. Dyer failed to pick out a team-mate after pouncing on the loose ball but he made amends when he slotted beyond Murphy after his initial effort had been blocked by Mirfin. Scunthorpe had failed to craft a clear opening before O'Connor somewhat fortuitously struck. The midfielder had only been on the pitch a matter of minutes when he deflected Togwell's strike after Nolan's initial effort struck the woodwork. Waghorn wasted a good chance to restore the two-goal advantage but the Iron were the better side in the final period of the match. In addition to Forte's shot and Wellens' clearance, the visiting team created several good openings and Josh Wright thought he should have been awarded a penalty after he went down in the box. But Ian Baraclough's side, who have now gone five games without a victory, could not find an equaliser and were punished when Moussa drilled the ball beyond Murphy after a lay-off from King. 90:00+4:26 The final whistle goes and the game is over. 90:00+2:51 Assist by Richie Wellens. 90:00+2:51 GOAL - Franck Moussa:Leicester 3 - 1 Scunthorpe A goal is scored by Franck Moussa from just outside the box to the bottom right corner of the goal. Leicester 3-1 Scunthorpe. 90:00+1:10 Unfair challenge on Richie Wellens by Chris Dagnall results in a free kick. Carl Ikeme restarts play with the free kick. 90:00+1:03 The ball is crossed by Michael O'Connor, clearance made by Michael Morrison. 90:00+0:47 Josh Wright sends in a cross, clearance by Jack Hobbs. 89:47 Unfair challenge on Jonathan Forte by Angelo Miguel Vitor results in a free kick. Josh Wright crosses the ball in from the free kick, clearance by Steve Howard. 89:10 Cliff Byrne concedes a free kick for a foul on Andy King. Richie Wellens takes the free kick. 86:39 Substitution Lloyd Dyer goes off and Franck Moussa comes on. 85:02 Martyn Woolford delivers the ball, clearance by Bruno Berner. Outswinging corner taken by Michael O'Connor. Josh Wright takes a shot. Richie Wellens makes a clearance. Inswinging corner taken right-footed by Josh Wright from the left by-line. 84:55 The ball is swung over by Michael O'Connor, Jack Hobbs manages to make a clearance. 84:42 Andy King sends in a cross. 83:37 The ball is sent over by Eddie Nolan, clearance by Bruno Berner. 81:23 Free kick awarded for a foul by Steve Howard on Niall Canavan. Free kick taken by David Mirfin. 80:43 Eddie Nolan crosses the ball, Michael O'Connor produces a right-footed shot from just outside the penalty area that goes harmlessly over the target. 79:59 Eddie Nolan delivers the ball, clearance made by Bruno Berner. 79:07 Andy King produces a right-footed shot from just outside the box that goes wide left of the target. 77:32 Substitution Michael Collins is brought on as a substitute for Sam Togwell. 77:32 Andy King delivers the ball. 75:26 Michael O'Connor crosses the ball, clearance made by Angelo Miguel Vitor. 75:18 The ball is sent over by Michael O'Connor, clearance made by Martyn Waghorn. 74:56 Corner taken short by Michael O'Connor. 74:38 Martyn Waghorn challenges David Mirfin unfairly and gives away a free kick. Joe Murphy restarts play with the free kick. 73:54 The ball is swung over by Cliff Byrne. Effort from inside the area by Jonathan Forte misses to the left of the goal. 73:02 Josh Wright produces a right-footed shot from just outside the box that misses to the right of the target. 71:10 Michael O'Connor concedes a free kick for a foul on Richie Wellens. Free kick crossed by Martyn Waghorn, David Mirfin makes a clearance. 69:56 Centre by Eddie Nolan. 67:29 Shot from deep inside the area by Martyn Waghorn goes over the bar. 66:47 Substitution Yuki Abe on for Paul Gallagher. 65:55 Floated corner taken by Josh Wright, Effort on goal by Michael O'Connor from just outside the area goes harmlessly over the target. 64:20 Booking Booking for Steve Howard. 64:00 Steve Howard concedes a free kick for a foul on David Mirfin. Joe Murphy restarts play with the free kick. 61:35 Unfair challenge on Steve Howard by David Mirfin results in a free kick. Strike comes in from Martyn Waghorn from the free kick. 59:55 Assist on the goal came from Cliff Byrne. 59:55 GOAL - Michael O'Connor:Leicester 2 - 1 Scunthorpe Michael O'Connor finds the back of the net with a headed goal from deep inside the penalty area. Leicester 2-1 Scunthorpe. 58:23 Cliff Byrne produces a cross, Michael Morrison manages to make a clearance. 56:59 Michael O'Connor delivers the ball, Richie Wellens makes a clearance. 55:59 Substitution Bobby Grant leaves the field to be replaced by Michael O'Connor. 55:35 Richie Wellens has an effort at goal from the edge of the box that misses to the right of the target. 54:12 Foul by Chris Dagnall on Richie Wellens, free kick awarded. Richie Wellens takes the direct free kick. 53:23 GOAL - Lloyd Dyer:Leicester 2 - 0 Scunthorpe A goal is scored by Lloyd Dyer from inside the box to the bottom right corner of the goal. Leicester 2-0 Scunthorpe. 52:57 Lloyd Dyer takes a shot. David Mirfin gets a block in. 51:05 Inswinging corner taken right-footed by Josh Wright from the left by-line, comfortable save by Carl Ikeme. 50:56 Eddie Nolan crosses the ball, clearance by Jack Hobbs. 49:11 Martyn Waghorn is caught offside. Free kick taken by Joe Murphy. 46:48 A cross is delivered by Lloyd Dyer, blocked by Chris Dagnall. Corner from left by-line taken by Paul Gallagher. 45:17 Martyn Waghorn has an effort at goal from just inside the box that misses to the left of the goal. 45:00+2:30 The players leave the pitch at half time. 45:00+2:00 Shot from just outside the area by Martyn Waghorn misses to the left of the target. 45:00+1:40 Martyn Waghorn decides to take the corner short. 45:00+1:18 Inswinging corner taken left-footed by Martyn Waghorn, Niall Canavan makes a clearance. 45:00+0:51 Martyn Waghorn takes a shot. David Mirfin gets a block in. 45:00+0:18 Bobby Grant takes a shot. Save by Carl Ikeme. 43:32 Jack Hobbs concedes a free kick for a foul on Bobby Grant. The free kick is delivered right-footed by Sam Togwell from right wing, save by Carl Ikeme. 42:49 Paul Gallagher takes a shot. Eddie Nolan gets a block in. 42:18 Cliff Byrne challenges Bruno Berner unfairly and gives away a free kick. Direct free kick taken by Carl Ikeme. 41:03 Martyn Waghorn is caught offside. Joe Murphy takes the free kick. 40:35 Paul Gallagher challenges Josh Wright unfairly and gives away a free kick. Josh Wright takes the free kick. 38:38 Martyn Waghorn is penalised for a handball. Joe Murphy takes the free kick. 38:14 The ball is sent over by Sam Togwell. 36:23 Effort from close in by Steve Howard goes wide left of the target. 35:44 The ball is swung over by Angelo Miguel Vitor. 33:00 Foul by Steve Howard on David Mirfin, free kick awarded. Direct free kick taken by Joe Murphy. 32:13 The ball is sent over by Andy King. 31:05 Jonathan Forte is ruled offside. Free kick taken by Carl Ikeme. Correction - 30:47 Free kick awarded for an unfair challenge on Cliff Byrne by Steve Howard. Direct free kick taken by Cliff Byrne. 30:47 Foul by Steve Howard on Cliff Byrne, awarded. 27:59 The ball is sent over by Eddie Nolan. 27:10 Free kick awarded for a foul by Jonathan Forte on Angelo Miguel Vitor. Direct free kick taken by Carl Ikeme. 25:47 Corner taken by Paul Gallagher, Headed effort from deep inside the penalty area by Steve Howard misses to the left of the goal. 25:20 Lloyd Dyer takes a shot. Save by Joe Murphy. 23:10 The ball is swung over by Eddie Nolan, Jack Hobbs makes a clearance. 20:59 Free kick awarded for a foul by Niall Canavan on Steve Howard. Paul Gallagher shoots direct from the free kick. 20:37 Lloyd Dyer fouled by Cliff Byrne, the ref awards a free kick. Jack Hobbs takes the free kick. 19:42 Jonathan Forte takes a shot. Save by Carl Ikeme. 18:21 The assistant referee signals for offside against Martyn Waghorn. David Mirfin takes the indirect free kick. 15:02 Corner from the right by-line taken by Martyn Waghorn, clearance made by Josh Wright. 14:07 Martyn Woolford has an effort at goal from just outside the penalty box which goes wide of the left-hand post. 13:23 Richie Wellens gives away a free kick for an unfair challenge on Jonathan Forte. Free kick crossed right-footed by Josh Wright, clearance made by Michael Morrison. 9:23 The assist for the goal came from Paul Gallagher. 9:23 GOAL - Martyn Waghorn:Leicester 1 - 0 Scunthorpe A goal is scored by Martyn Waghorn from deep inside the penalty area to the top left corner of the goal. 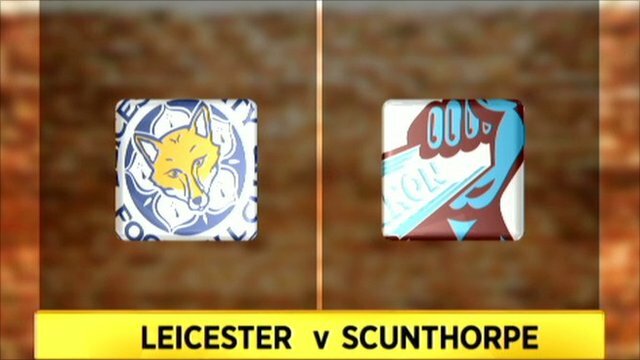 Leicester 1-0 Scunthorpe. 8:21 Chris Dagnall takes a shot. Carl Ikeme makes a save. 7:51 Angelo Miguel Vitor gives away a free kick for an unfair challenge on Martyn Woolford. Direct free kick taken by Eddie Nolan. 7:28 Free kick awarded for a foul by David Mirfin on Bruno Berner. Richie Wellens takes the free kick. 5:33 Free kick awarded for a foul by Cliff Byrne on Lloyd Dyer. Carl Ikeme restarts play with the free kick. 4:35 Unfair challenge on Angelo Miguel Vitor by Chris Dagnall results in a free kick. Paul Gallagher takes the direct free kick. 1:57 Eddie Nolan produces a cross, Carl Ikeme makes a save. 0:56 The ball is crossed by Paul Gallagher, Andy King produces a header from inside the area that goes over the bar.